My 75th Ranger Regiment RBA Vest with Level IIIA Flexible Vest (softarmors) and Ceramic Upgrade Plate. Ranger Body armor (RBA) is a ballistic vest that was used by the 75th Ranger Regiment and others in the 1990s and 2000s. Ranger Body Armor (RBA) was designed by the U.S. Army Natick RD&E Center and manufactured by Protective Materials Inc. to meet the operational needs of the 75th Ranger Regiment. RBA consists of a two part system: a flexible vest and a rigid plate, both of which provide ballistic protection to the upper torso. The Flexible Vest consists of an Aramid (Kevlar KM2) filler encased in a nylon woodland camouflage-printed carrier. The vest weighs approximately 8 pounds in size medium, and protects the front and back torso from most 9 mm and 44 magnum threats, in accordance with Level IIIA of the National Institute of Justice Standard 0101.03, Ballistic Resistance of Police Body Armor. It also provides fragmentation protection similar to that of the Personal Armor System for Ground Troops (PASGT) Vest. The vest is available in three sizes: medium, large, and extra-large. The 8 pound Ceramic Upgrade Plate, which provides front torso coverage, is fabricated of 2\" x 2\" aluminum oxide ceramic tiles. When the upgrade plate is inserted into the front pocket of the vest, it protects an approximate 10\" x 12\" area from 5.56 mm and 7.62 mm ball projectiles. RBA was Type Classified Limited Procurement Urgent, and is available for purchase through GSA contract GS-07F-6041A, Protective Materials, Inc. 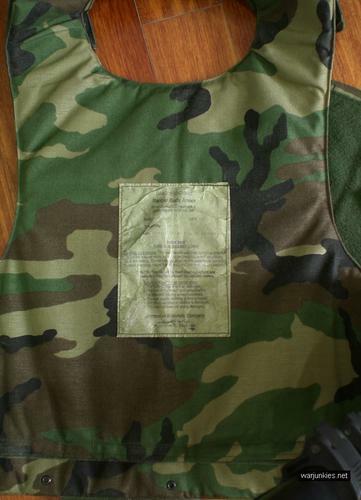 The negotiated cost through the GSA contract for a size medium vest and plate is $738.